Two severe weather warnings, for thundery storms tomorrow and torrential rain on Friday, have just been issued by the Met Office. The two yellow severe weather warnings were issued this lunchtime, the first in place from 2pm to 11.50pm tomorrow and the second from 00.10am to 7pm on Friday. Tomorrow’s covers a large chunk of the south of England up to the midlands, and while many areas will miss the storms, where they do hit they are likely to result in a large amount of rain. 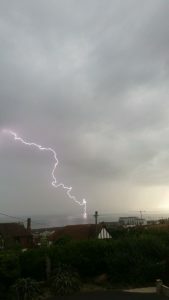 The Met’s Chief Forecaster said: “Thunderstorms may break out in warm, moist air spreading up from the continent. Some locations could see 30-40 mm in an hour and where this falls on urban areas or main roads it could cause disruption to transport and possibly to power. Meanwhile, another warning for storms has been issued for the following day, covering most of England. It says: “Rain spreading from the west may turn locally very heavy and thundery from early Friday, with the risk of some torrential downpours very locally. “Please be aware of the risk of some localised flooding. “A front coming from the Atlantic will merge with warm, unstable air over the country to bring the risk of 30-40 mm in the hour in places and more than 50 mm in a few hours.